ALAN STUBBS was named SPFL Championship Manager of the Month today in recognition of Hibs’ 100 per cent league record in February. 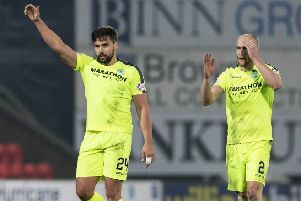 The Easter Road club won all three league matches without losing a goal, leading to Stubbs receiving a second Manager of the Month award this season. A 2-0 victory over Rangers at Ibrox, a 3-0 home win against Dumbarton and a 1-0 triumph at Alloa continued Hibs’ fine recent run of form. Stubbs won his first Manager of the Month award last September and has continued building momentum in Leith after a slow start to the campaign. Hibs are currently second in the Championship table, 20 points behind leaders Hearts but three better off than Rangers in third place. The Ibrox club have two games in hand on both Edinburgh sides.